Learn to cook Guatemalan recipes is something you can take home with you to remember long after your trip is over. Are you looking to experience Guatemala in an authentic and personal way? Experience the taste and flavors of Guatemala cooking at the Lake Atitlan Maya Kitchen. This class will help you understand how our Mayan culture and Spanish colonial influence blended together in a perfect harmony through food. You will have lots of hands-on fun learning how to cook up three authentic Guatemalan dishes during this 3 hour Guatemala cooking class. 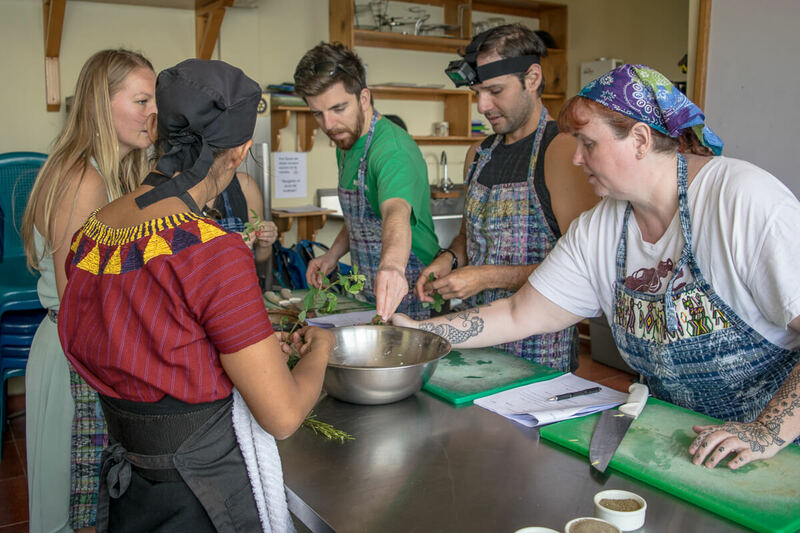 Learn how to prepare traditional recipes that are unique to Guatemala, and come away with all the skills you need to prepare them in your own kitchen. Each class can include a trip to the market to purchase the ingredients (optional and for an additional fee), preparation of the dish of your choice, a printed copy of the recipe to take home, and enough of the finished dish to feed your group or family. Private classes can be arranged for individuals or shared classes for small groups. Our Mayan cooks are native to Lake Atitlan, and they carry on the rich tradition and culture that is expressed in the food. Classes are taught by Claudia, a graduate of Amigos de Santa Cruz culinary arts program. Most popular recipes are Pepian, Jocon, tamales, frijoles, Subanik, Guisado, guacamole. Best cooking class-learn to cook Guatemalan recipes. All proceeds support the community of Santa Cruz la Laguna through the non-profit Amigos de Santa Cruz.